-Frozen food boxes are not recyclable because they are sprayed with a plastic coating to protect the contents against freezer burn. Once the paper has this coating, it does not break down in the cardboard recycling process. Please throw these in the trash. -Plastic bags should be deposited in the separate plastic bag bin (if your office has one) or at the plastic bag recycling stations that can be found at most grocery stores. -Compostable cups, dishes, and flatware should be deposited in the compostables collection bin (if your office has one) or taken home by someone who has a compost pile. -Any plastic items other than narrow-necked #1 and #2 bottles should not be put into the regular recycling. If your office collects #5 plastics or plotter roll end caps then those can be put into the special collection bins. Other plastic items unfortunately should be thrown away. 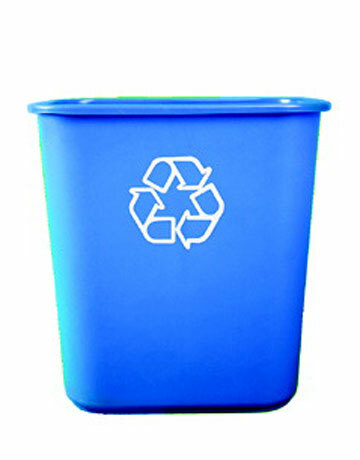 -Pizza boxes or any other paper products with food on them should not be recycled. Check out this article on Earth 911 for a good explanation of the reasons – http://earth911.com/news/2009/03/02/the-pizza-box-mystery/. If you have large boxes or stacks of drawings, please take these directly to the recyling dumpster instead of piling them up next to a small bin. Also, please rinse drink bottles, metal cans, or other items that could draw bugs and other pests. As always please feel free to ask a Seeds of Green member if you have a question about a particular item. Thanks for helping keep the recycling bins sorted correctly!